New Off-Season Rates! The best Deal available to be On The Beach! Freshly updated with new leather sofa and recliner. This one bedroom unit features a very comfortable Queen size pillow top mattress/bed and a pillow top twin mattress/bed in the master bedroom. We have just installed a Full size bed for additional sleeping space in the living area just like Willy Wonka's Chocolate Factory!! This unit is in Ocean View, right on the beautiful Chesapeake Bay beach. There you will be situated on a public beach access. This is a perfect place for boaters and fishermen who want to bring their water craft on vacation with them. The free public marina with 3 concrete boat ramps is only a few blocks away. We have plenty of off-the-road parking space for anything/anybody you might want to bring. This unit is freshly updated with new appliances, new carpet, a powerful AC unit, WiFi and great kitchen. This is a family endeavor. George, Kathleen and George Jr. are all working hard to provide a fantastic vacation value. We love our Historic and Rustic little cottage. The location can't be beat as you are about a "1/4 cup of coffee" walk to the beautiful beach - right out your door with no streets to cross. You will love this freshly updated, freshly painted and furnished unit. All new appliances and carpet. Just a stone's throw from the beach with no roads to cross. Just walk out your door and you are there! Plenty of parking to accommodate your boat/trailer with very productive fishing from the shore as well as off-shore. Beach Side! A perfect location! Just installed new furniture - a new leather recliner and a full size leather sofa with electric recliners on either end. We offer a Queen Bed and a Twin Bed in the Master Bedroom and a full size bed tucked away in the living room. 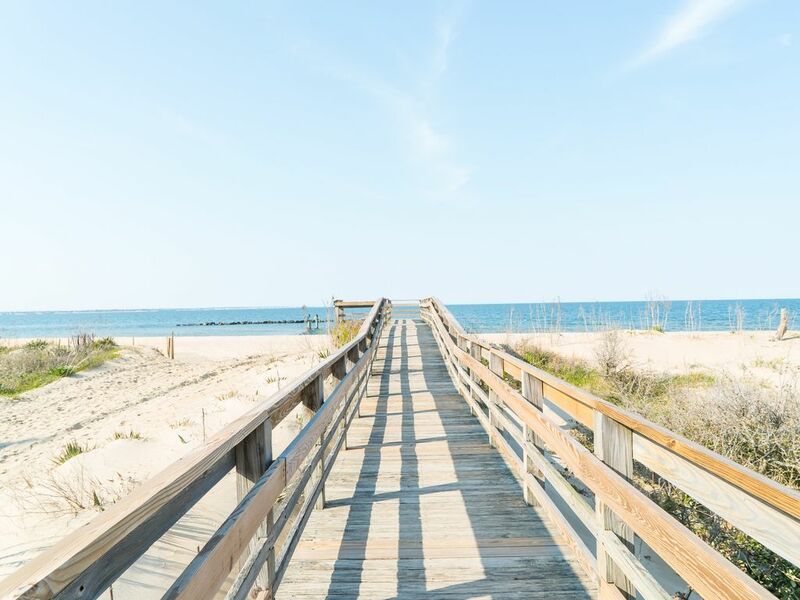 The Virginia Beach Oceanfront is only about 10 minutes away. The house itself is a single story and unless you are very tall, you will not be able to see the beach. Although, you will be able to hear the waves! This Beautiful Home is situated on the sands of the Chesapeake Beach. There are no streets to cross, just walk out the door and you are about 60 feet from the Beach. Technically it's the Chesapeake Bay, but sometimes it can be almost as rough as the ocean! All new kitchen appliances. Fully Stocked and ready for your culinary skills! A large yard for the four legged friends to run and take care of business! The is a Historic property having been built around the 1940's. It is a single story flattop home that is almost Beach front. There is a house that sits in between this and the beach. But there are no roads to cross, and you are just steps away from the boardwalk that takes you directly to the beach. Great for fishing and boating. The public boat ramps are only 5 minutes away. No need to leave your boat at the Marina, bring it back and park it in our yard. Plenty of parking available for you lovers of the water! Going to see our kids, we needed extra room because of our dogs and we found this one, which was very economically priced and convenient.. This small perfect rental was just a block away from the kids so we could walk to their home and just a hop skip and jump to the ocean. It is decorated so cute, kitchen is small but, with all the great restaurants there, why cook? You are on Vacation! Do not sit in the recliner, you will not want to get up! It is a great clean rental, check it out! Although we did not meet George, the place was exactly as advertised. Nice little place, a 1/4 cup of coffee from the beach. great for a walk in the am. Unit was clean and accessible. We were supposed to bring our dog , and he was gladly accepted by the owner, but he did not come, I wish he had due to all there was to do and go with the dog. Parks, craft shows and just good ol walks. If we come back to the VA coast we would stay here again. Thanks Goerge. The owner is a nasty and untruthful person who fails to provide truthful information about his property due to the fact that the neighborhood is located in a place that is laden with high crime in accordance with the policemen I filed a police report with as a consequence of a mugging.He is also in violation of the federal law which provides for the assistance of service animals. I would recommend never coming to his place as he is just a very unlawful, untruthful and nasty person and the neighborhood of his property is in a high crime District where it is common place for cars to be broken into among other things. My family and l really enjoyed our stay. The owner went above and beyond to accommodate us and to ensure our stay was comfortable! Thanks so much. We love our little Bungalow and are making improvements ever day! Come back again soon. Super close to the beach! Cottage was very clean! Great non-stick cookware and ample dishes for eating in. It was the perfect size for our family of four. Close to good restaurants, shopping and other sites. All requests were responded to promptly. We would definitely return to this property. Thank you Ben. Come again soon! We are located in one of the least known beach resorts on the East Coast. The Ocean View neighborhoods are being discovered again after years of being overlooked by the other Large Commercial Resorts in Virginia Beach and the Outer Banks of North Carolina. This is a perfect area for quiet family gatherings and for those wishing for seclusion and just to enjoy the waters of the Chesapeake Bay. And although it is not commercialized like many resort areas, it has all the convenience of home with nearby airports, hospital, grocery stores, drug stores, marinas, fishing and easy access to the interstate and I-64.